Christmas and Hanukkah—or other holidays where extended family gathers in one place—is an optimal time to gather stories and memories via oral history interviews. There needn't be a lot of pressure: Simply turn on your smart phone’s voice recorder or set up a video camera on a tripod, then forget it’s there...and begin reminiscing. The important thing is that you relax and let the stories flow. Don’t wait until next year or when everyone is available or any other “better time”—trust me when I say: Now is always the right time! When family gathers at Christmas, use the opportunity to share stories and memories of days gone by—trust me, it’s as entertaining as it is valuable! Use these questions merely as a guide or to give you ideas for questions of your own. The key to any good personal history interview is listening—so ask follow-up questions that genuinely interest you, and let the stories take their own paths...that is usually when the magic ensues! Is there a dish you always associate with Christmas Eve or Christmas day Do you know who has the recipe, and who originally cooked it for your family? Did you or your family make cookies or other special desserts to share with neighbors during the holiday season? What about leaving food for Santa—and his reindeer? Are there any foods, from the holiday season or year-round, that remind you of your heritage? Did your parents make you eat anything you absolutely hated? What food(s) do you associate with comfort? With the onset of winter? Who made the cakes for birthdays in your home? Do you recall any massive failures at cooking—a horrible dinner, burnt pie, missing ingredients? Did you hang Christmas stockings? By a fireplace, or somewhere else? Were they filled by Santa? Do you have any favorite memories of stocking stuffers? Did anyone in your family or neighborhood dress up as Santa? Did you know it was them? Have you or anyone else in your family continued that tradition of playing Santa—and if so, how does it make you feel? What traditions do you most fondly recall from your childhood? Are there certain traditions that have persisted for generations in your family? What traditions have you begun anew with your own nuclear family? Is there a memorable gift you have given someone? What time did you wake up on Christmas morning? Was it earlier than your parents? Did they make you wait before starting the festivities? Do you recall the feeling of anticipation on Christmas Eve? What other times in your life do you recall similar feelings of anticipation? Did you (and your siblings/family members) want to rush through the gift giving? Was there a sense of order and gratitude opening gifts, or was it wrapping-paper mayhem? Did you ever look for or find evidence of Santa? Were there ever times when hardship made gift giving at the holidays challenging? How did that make you feel? Do you have a story from that time, or a lesson learned? Did you help pick out gifts for those you loved, or was it strictly a parent thing? Do you remember how you felt when you discovered the truth about Santa? How old were you? What religion, if any, is your family? Were you devout? Members of a congregation? Was your church or temple community a central part of your life? Did you go to church on Christmas morning? Midnight mass? What memories of you have of those times? Are you spiritual? How does that manifest itself in your life? Was your family very affectionate? Describe how they showed love, or if you wished there was more physical affection. Are you a hugger? How does it make you feel? Who in your family gives/gave the best bear hugs? What is/was that person like? Did you cuddle with your parents? Do you cuddle with your own children? Grandchildren? What does it mean to you? Did you write letters to Santa? If so, where did you mail them? Did you ever hear back from the North Pole? Do you recall getting Christmas cards during the holiday season? Did your family draft a holiday letter (many people keep these as part of their family history archive—did you save any of them)? Where did you live when you were growing up? Did you generally have a white Christmas? Do you remember the first time you saw snow? What was your favorite snowtime activity—sledding (or did you have a toboggan? ), making snow angels, snow balls fights? Or how about ice skating? Shoveling? Do you recall snow days from school? Listening to the radio for announcements, or waiting for a parent to wake you up? How did you occupy yourself on snow days? Did you build snowmen? What would you use for the nose and eyes? What smells remind you of your childhood home? What makes you feel most at home now, as an adult? What was the address of your favorite home? Why was it your favorite? Have you ever visited a home from long ago—how did it make you feel? Did you move often while you were growing up? Did that affect your personality or self-esteem? 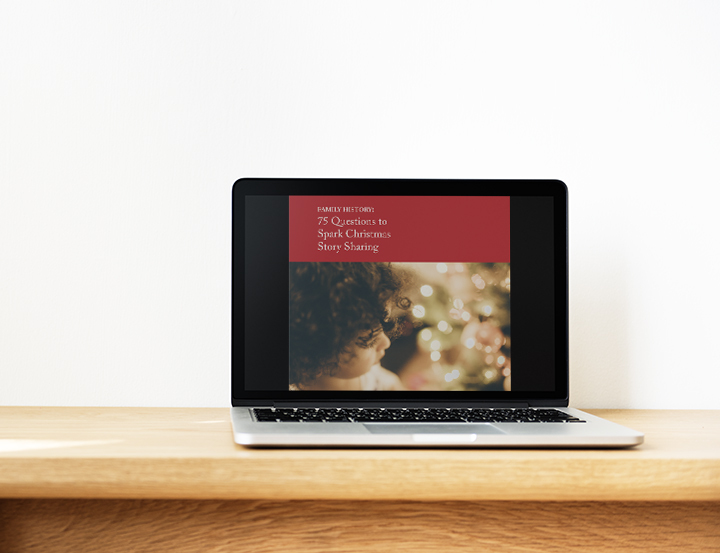 Download all 75 questions in a handy printable booklet! Give the most unique holiday gift! Cherished memories last a lifetime—and beyond, if you preserve them.